The opening track “Ever” on the band Flipper’s classic first album, Album, contains the lyric, “Ever look at a flower, and hate it?” As I was playing Satisfactory, the new game from the developer of Goat Simulator, I realized that lyric pretty much sums up what the game is about. Despite my discomfort with destroying nature for the needs of an uncaring corporation, the streamlined efficiency of production keeps me coming back. Satisfactory presents the tantalizing idea of creating a perfectly tuned system that always does exactly what I want it to. I found the game most irresistible once I unlocked conveyor belts. Most of the buildings you can build have an input and output, meaning they can be connected by conveyor belts to each other. 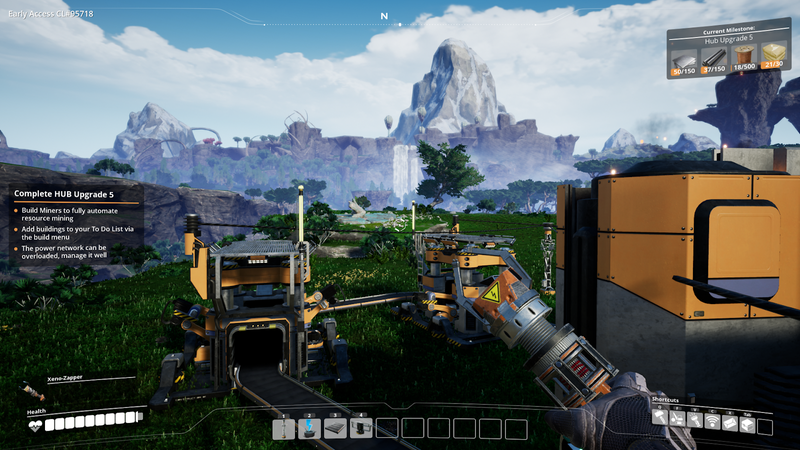 That means that you can connect a mining machine to your ore deposit, have that travel via conveyor belt into a machine that makes it into iron ingots, and then travel from there to a machine that makes it into iron rods, which you can use to craft other machines. I started thinking about the possibilities as soon as I got my first chain of buildings up and running. Now that I have the ability to split conveyor belts, I can have half the ingots turn into another crafting material, and maybe eventually rejoin the belts to make a third crafting material.